I usually do my reviews in batches, but here’s a book that deserves its very own post. I read it purely because it was Waterstones’ book of the month for January and by the time I had read the free first chapter on their website I was drawn in enough to order the book straight away. That says a lot for the first chapter; usually I stay well clear of the latest books being hyped by the booksellers. 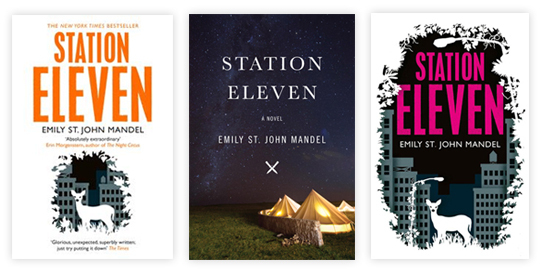 Station Eleven by Emily St. John Mandel is the story of a theatre company travelling across a post-apocalyptic North America performing Shakespeare’s plays for communities of survivors, interwoven with an account of a pandemic that wiped out civilisation and the first twenty years of the surviving one percent of humanity dealing with the aftermath. What starts out as a collection of seemingly unconnected subplots following different characters’ lives, spanning the continent and some forty years in time, eventually comes together as a powerful narrative of surviving the end of the world and being catapulted into a new reality where all the rules have changed. Mandel’s writing is poignant and perfectly timed, creating a page-turner that moves deeply without being sentimental. She imagines a post-apocalyptic wasteland that is filled with dangers but strangely inviting, and populated with characters and relationships that are fragile, flawed and utterly human. What I loved most about this book is how it explores the practical day-to-day realities of surviving in a worldwide ground zero, where resources are as sparse as law and order, where despair breeds fanaticism and where a moment of mercy could cost your life. It makes you stop and think about just how fragile our civilisation really is; it makes you wonder whether you’ve got what it takes to survive, all the while also reminding us just how difficult it would be to re-build a world that’s even remotely as safe and comfortable as the one we’re used to. Devastating and yet beautifully optimistic, and filled with literary beauty, this is without a doubt my favourite book of the year – and I’m confident enough to say that already in January.